Writing the six-book Caroline Abbott series for American Girl gave me lots of opportunities to develop fascinating aspects of history into plots. Even so, the story of Sackets Harbor during the War of 1812 is so rich that I had to leave lots of things out. All along, I hoped that I’d be invited to write a mystery for Caroline. And I was! Traitor in the Shipyard will be available in February, 2013. As I did research and developed ideas for the original Caroline books, I found many references to historical events that seemed perfect for a mystery plot. After all, Caroline Abbott lived right on the border between the United States and British territory. 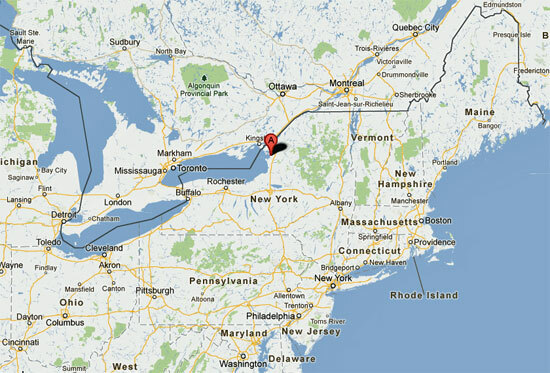 Before war was declared, people on both sides of Lake Ontario frequently traveled back and forth. Once the war started, no one was sure if they could trust former friends and neighbors. Who had decided to be loyal to the United States? Who chose to work for the British? British spies were particularly interested in American shipbuilding efforts. 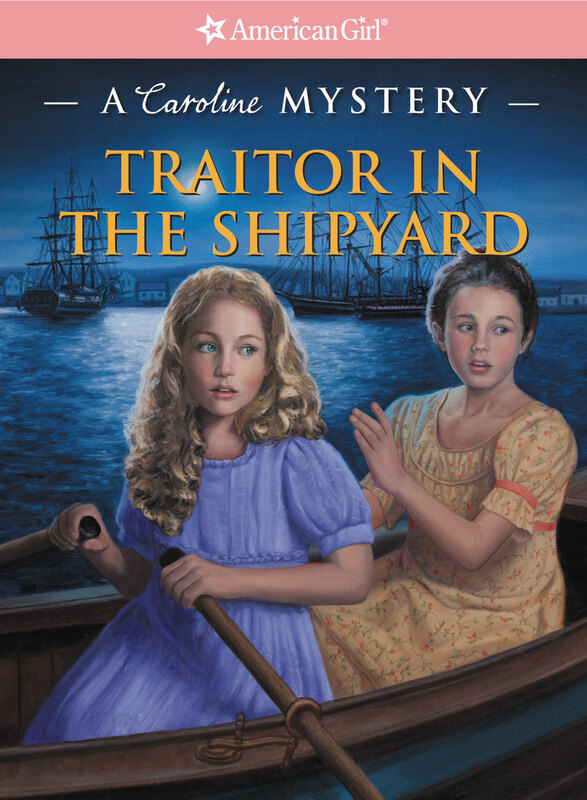 When Traitor in the Shipyard begins, Caroline, her family, and workers at Abbott’s shipyard are racing to build ships the American Navy desperately needs to defend Sackets Harbor from British attack. Meanwhile, workers at the Navy shipyard are finishing the USS General Pike. 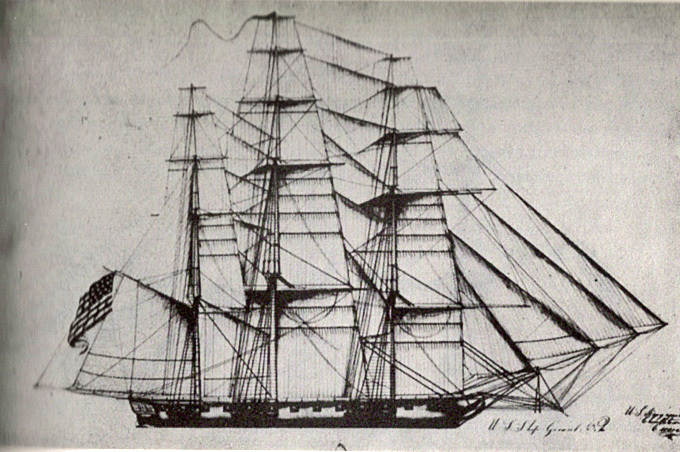 At the time of its launch in 1813, Pike was the largest warship on Lake Ontario. “Have you heard when General Pike will be ready?” she asked. Once complete, the frigate would be the mightiest vessel ever to sail Lake Ontario. “Papa says the navy’s most important job right now is protecting General Pike,” she said. Caroline looked back over the harbor. If the Americans didn’t get General Pike into service soon, they might not be able to defend themselves. Caroline is worried when she learns that spies may be lurking in Sackets Harbor. Then, a long lost friend of Papa’s shows up. Papa is delighted to give him at job at Abbott’s, but soon, strange things start going wrong. Caroline is sure a spy is making trouble at the yard—but it is one of Abbott’s trusted workers, whom she has known all her life, or could it be Papa’s dear friend? I hope you enjoy Traitor in the Shipyard as a good adventure story… and I also hope it helps you imagine what the people of Sackets Harbor faced every day during the War of 1812. This entry was posted on January 6, 2013 at 3:26 pm and is filed under Caroline Abbott books. You can follow any responses to this entry through the RSS 2.0 feed. You can leave a response, or trackback from your own site. My daughter can’t wait to read it! I love the AG mysteries and am so glad that you were the one to write Caroline’s. I’ll buy it the day it comes out. Am so looking forward to reading it. Thanks, Carolyn! I hope you enjoy! I’m really excited for the new book! I just finished reading the main series, and it was really good! Thanks, Amy! You’re all set for the mystery. I can’t wait to read it! Is that Lydia on the cover w/ Caroline? WOW–You are busy. Great to make use of the info you had already gathered. I love Traitor in the Shipyard. It’s a really good book. My mom and I are addicted to all the Caroline books. There so good Kathleen. I’m also taking a class at Old World Wisconsin this summer with my two friends! I can’t wait! I’m glad you enjoy the Caroline books – and extra glad that you’ll be taking a class at Old World! I bet you’ll love it, especially since you’ll get to share it with friends!